If you haven't heard of Drag Week you should look it up right now. Here's a link to the 2014 results. 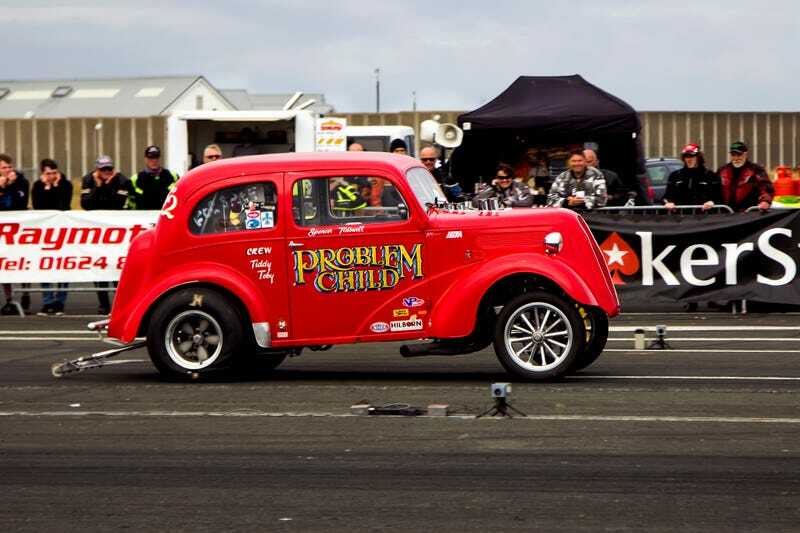 It's billed as the search for the fastest street driven car and organized by Hot Rod Magazine. They drag race at 5 different tracks over 5 days. The cars have to drive between each track themselves. You are basically allowed to work on your car as much as you need to between tracks. Here's a description of the Unlimited class rules from 2007. One of the fastest has been Larry Larson. He own Larson Race Cars. He won Drag Week with the same car for 5 years, 2008 to 2012. His car was very impressive in that it got consistently faster each year. In 2008 it's average time was 7.97 seconds in the quarter mile. By 2012 he was down to 7.081 seconds. His car was a full steel body car. He choose to sit out the 2013 Drag Week because of the fiberglass cars he thought were "ruining" the Unlimited class. But the recent arguments by Larry Larson and hatred of fiberglass bodied cars just seems a bit hypocritical based on reading the specs of his newest car (S10 truck). This is from the January 2015 Hot Rod Magazine. "He ordered a Pro Stock truck composite front clip, hood and doors from Hairy Glass, out of Jacksonville, Florida." Another note says "The truck's steel doors are replaced with carbon-fiber versions." Now I'm just a bit confused as to what exact point he thinks a steel car is steel and not composite. In fact, I'm sure there are plenty of the slower street cars on Drag Week that have fiberglass hoods. How about aluminum bodies? Now Larson's newest truck has run as fast as 5.95 at the Street Car Super Nationals. While this is also incredibly fast, much faster than the current Drag Week champ, after reading about the modifications, running menthol and a completely separate fuel system, removing a lot of parts, and replacing by my estimation ½ of the body with fiberglass anyway, I'm not sure why Larson is spending so much time badmouthing the full fiberglass cars. I think it's commendable that Larson has taken the initiative to beat something he disagrees with, but I'd like it even more if he didn't waste time complaining about things he disagrees with. Just because it's fiberglass doesn't make it less of a street car and it's completely legal per the rules. Underneath the cars are nearly the same, it's just the wrapper he disagrees with. There are 2 ways to make a car fast, make it light or make more power. He has chosen the more power, but making a lighter car is just as much within the rules. I say keep Drag Week completely open. Once you start putting rules on it it removes the innovation.